Companies operating in an economic zone receive public aid in the form of income tax exemptions. Maximum amount of aid is calculated based on the value of planned investment or 2-year costs of newly hired employees. It depends on the size of an enterprise and the localization of the investment. 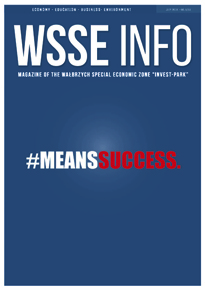 Wałbrzych Special Economic Zone is one of the biggest and fastest developing zones in Poland. It has investment lands in 58 locations in south west part of Poland – in direct proximity of Czech Republic and Germany. In 2014 if was awarded in the fDi Magazine for its complexity of investor’s service. Check what events are coming up in the nearest future.